STAR TREK At 50: Enterprise - First Flight | Warped Factor - Words in the Key of Geek. Matthew Kresal looks back at a stand-out episode from Enterprise's second season. Enterprise, as it was known without the Star Trek prefix for its first couple of years, was promoted as being a prequel series to the original Star Trek TV series. Yet for much of that same time frame, it could easily have been just another Star Trek show as the crew seemed to wander the galaxy far from home and often out of contact with Starfleet. Indeed the only way to know it was a prequel series was the less than advanced technology and the occasional first contact with one of the better known alien races of the series. Occasionally through, it would be what it was meant to be. First Flight, airing late in the show's second season, was just such an episode. When initially pitched, Enterprise was intended to be far more a prequel series than it eventually became. One of the earliest notions for the series was the idea of exploring the early days of Starfleet and the leading up to the building of the first star ship. While the idea was eventually all but scrapped, First Flight is the closest fans would get to the original notion behind the series. Pulling inspiration from the Tom Wolffe book and 1983 film The Right Stuff, First Flight takes viewers into the early days of the NX program as Archer remembers his recently deceased friend Robinson played by actor Keith Carradine. With big changes coming to Enterprise just two episodes later in the season finale The Expanse, this might well have been the show's last (if somewhat belated) chance to tell this story. Drawing inspiration as it does from The Right Stuff, the episode works very well indeed. There's references and indeed nostalgia for those early days of space flight with scenes of Archer, Robinson and members of Starfleet sharing drinks in a bar that echo the real-life Poncho's Happy Bottom Riding Club that existed at Edwards Air Force Base during the 1940s and 1950s. The cockpit of the NX prototypes, NX Alpha and NX Beta, along with the flight suits worn by the Starfleet pilots also call to mind the early days of the space program as astronauts sat in cramped space capsules, wearing pressure suits and wondering if they might not live through the flight. Though obstinately set in the future, First Flight is full of earning to those heady days, the excitement and the danger that went along with them. It's in the flashback sequences that the episode is at its best. It's fun to watch Scott Bakula playing a younger, even reckless version of Archer who yearns to get out there and enters into a not so friendly rivalry at times with Keith Carradine's Robinson. Carradine's Robinson makes for an interesting foil for Bakula's Archer as the men are quite alike, though whereas Archer is trying to live up to his father's legacy, Robinson seems most keen on just flying. Robinson comes across as a proto-Kirk in that respect, much more so than Archer ever does across four seasons of Enterprise. Also, their rivalry calls to mind that of aviators Chuck Yeager (the US pilot who became the first to break the sound barrier) and Scott Crossfield which is portrayed in the book of The Right Stuff. 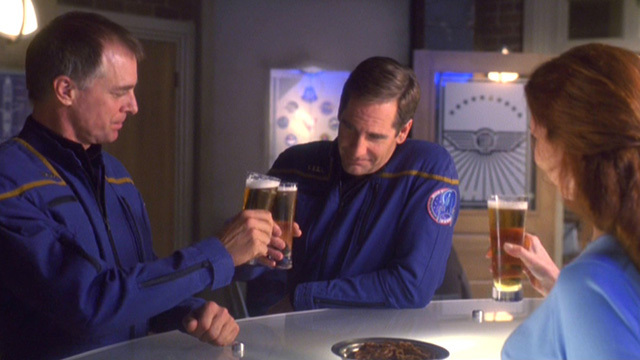 The episode also shows us the beginning of the friendship between Archer and Trip Tucker, something that both Bakula and Conner Trinneer play nicely. 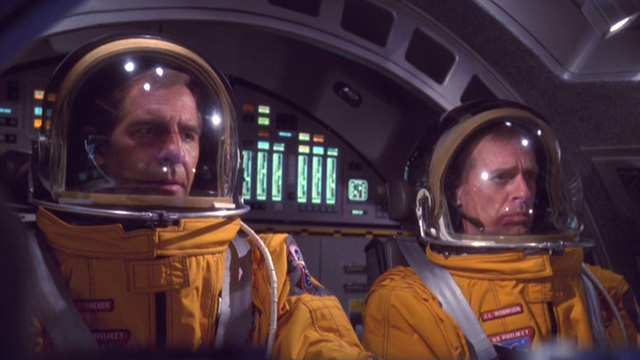 From an acting point of view, First Flight is a solid episode, especially for Bakula. Where the episode is at some fault is in its structure. First Flight is largely told in flashbacks, something that Enterprise had done before with its 1950s set episode Carbon Creek. Yet whereas the nature of that episode meant that interrupting the flashbacks not only worked but was necessary, here it is considerably less successful. It might be in part because the framing story, which features Archer telling T'Pol about the events while they're in a shuttlepod investigating a dark matter nebula, might be the cause of that as the dialogue is at best functional and laughable at its worst (it might also be worth mentioning that dark matter had already been investigated in the earlier Enterprise episode Breaking The Ice, but never mind). The flashback nature also undermines some of the episode's mini-cliffhangers at the commercial breaks, especially one early in the episode that is set around the apparent death of a character whom we know isn't dead, leads to an immensely melodramatic moment. The flashback structure isn't perfect but it gets the job done, even if the results are less than satisfactory at times. Despite issues with its structure, First Flight is still largely a success. The performances and the flashbacks are all solid, allowing Enterprise to tell a story quite unlike any other in its run. 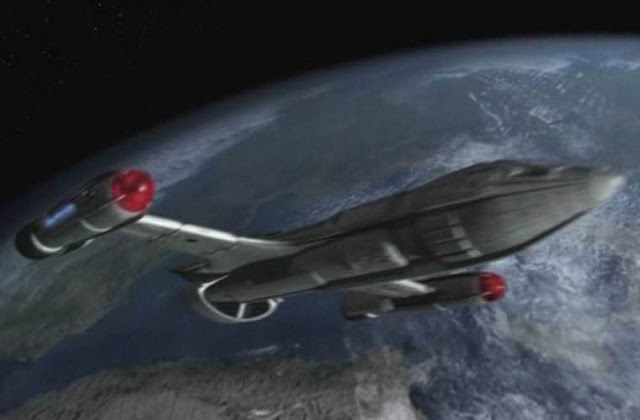 It's also a chance to view the series that Enterprise might have been had things gone differently, if it hadn't effectively spent years sitting on its laurels repeating the show's cliches or telling the ill-defined Temporal Cold War story before a mid-course correction that came too little too late. Instead this is a story of humanity reaching out for the stars with hope and perseverance, always at the brink of the known. It's Star Trek, and Enterprise especially, at its best. I can only wish we had gotten more episodes like this.